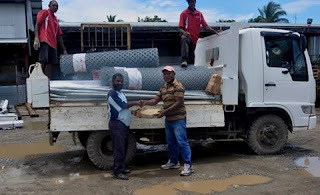 USINO Local Level Government in the Usino-Bundi district of Madang Province is strongly supporting economically viable community initiated impacted projects in its ward council areas by encouraging Small and Medium Enterprises (SME) program. Under the leadership of the Usino LLG President, Mr. Joseph Kumun, the LLG is also supporting family and individual poultry projects to ensure families in the concerned council wards in the Usino LLG have positive impact in their community. On Wednesday Feb 8, Mr.Kumun presented a truck load of hardware materials bought from Plum Trade in Madangto Mathew Yakai, the initiator of the duck project representing the Borkent Family and Ward 31 from Usino Ples. The project to be established at Yamagi village in Ward 31 is aimed at raising awareness on the self-sustainability programs that can eventually eradicate some of the socio-economic impediments in the community. Mr.Kumun presented the hardware materials worth K6,644.60 included 28 iron roofs, 6 galvanised mesh wire for duck fence, 40 intermediate posts for fencing and other materials to complete the duck shelter and the fence. “My priority is to create wealth for the people I represent,ensure they participate in the economy in economic terms that will eventually eradicate someof the social issues,”Mr.Kumun said. Mr.Kumun said he is adamant to empower individuals and group business start-ups and expansion, strengthen their capacity with responsible entrepreneurial trainings and ensure that the people of Usino LLG become self-employed entrepreneur. “This is in line with the Government Vision 2015. The peopleof Usino have the opportunity to benefit from SME through demands for goods and services created by major investments in the district including Marengo Mine, RamuNiCo, Banam Oil & Gas and Ramu Agri so I as the leader must empower my people to tap into these opportunities,”Mr.Kumun said. Mr.Yakai when receiving the materials said he will set up a duck project using the Public-Private-Partnership (PPP) concept by bringing Ramu NiCo Community Affairs Agriculture expertise, the local Ward 31 people in the Usino area with Usino LLG to ensure the duck project grow into success. “The duckproject will stand as a yard stick to address many social issues in the district. Usino villages and Ward 31 has a lot of opportunities and potentials to generate income by engaging in cocoa,poultry project, piggery, timber, agriculture and the duck project is a start up to show to the locals that they can do something for themselves then waiting for handouts,”Mr.Yakai said. Mr.Yakai said the project will be set up under his management and later involve other families in Ward 31 as a pilot project to empower more duck farmers and other economic activities. “This will be a model project by Usino LLG with technical advice from RamuNiCo CA Agriculture Office with direct involvement from Ward 31 as a partner as we are all within the RamuNiCo pipeline impacted area,”Mr.Yakai said. RamuNiCo management supports the duck project and gave assurance to provide technical advice and other assistances when required within its capacity to ensure the Project becomes a successful model farm. RamuNiCo on Wednesday Feb 8 provided the transportation of the hardware materials to Usino. Caption:Usino LLG President, Joseph Kumun presents the hardware materials to Mathew Yakai, the coordinator of the proposed Usino dark farm project on Wed Feb 8, 2017.